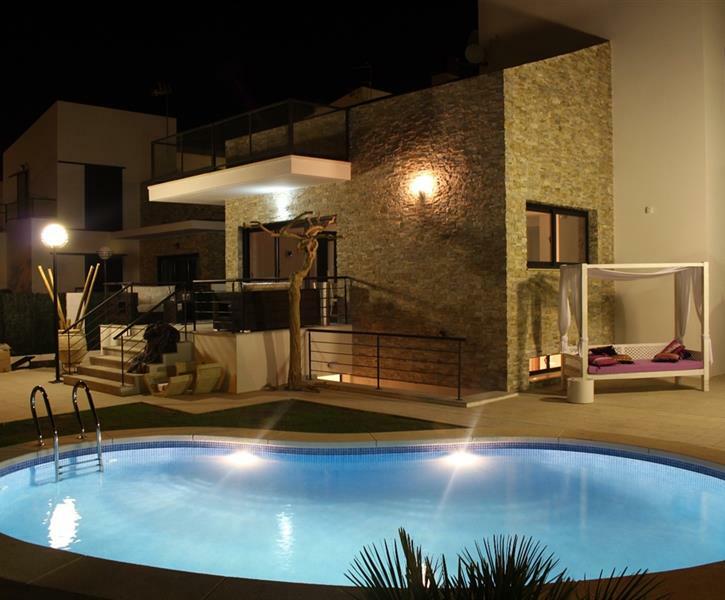 Beautiful holiday villa with private pool for rent to spend your beach holiday. Suitable for families with children max 8 adult Clean & comfortable, positive reviews!. Really Nice and modern house with a lot of facilities. We rent the house 2 month for a professional cycling team and sometime we was 10 persons in the house and that was not a problem. Downstair there is a lot of place for a lot of material.. The street is really quiet and there is so many of small and wonderful track for mountain bike and walk near the house. Sander and Veronica are really easy to contact. We have one problem with the wash machine and directly we have a new one! For sure that a nice place to be for sport, family, friends holidays. lovely holiday, the villa was beautiful much better than expected, perfect location being in the middle of all attractions as well as shops and bars close by, veronica the villa liason was amazing having picked up and delivered medical supplies for our son, meaning there was less to worry about, would deffinatly recommend to anyone, looking for either a relaxing or adventurous holiday, wish we could have stayed longer. I organised the villa few months ago with the owner for the last 2 weeks of July, the communication was very good and precise. The villa is so so relaxing we were a party of 10 people from 10 to 80 year old and every one find a space to relax, play or have a conversation.. The swimming pool was great the right size it looked much smaller on the picture, the view of the mountains is awesome, 2/3 supermarket 7mins drive away, airport was about 35 mins, the beach was 10 mins drive and plenty of activity and restaurants just few mins away, the area is very quiet too. Veronica the lady who manage the property was ever so helpful and efficient. One recommendation is to do the Puig Campana somite amazing view done slowly in 6 hours up and down go early and take plenty of water. Thanks for memorable holiday. This is a beautiful, modern villa equipped with all mod-cons. We used it as a base to explore the Costa Blanca but could have quite easily stayed in every day, it really is that nice there. It's split over 3 levels with mountains of space - we were a group of 7 with 3 children and it never felt crowded. The kitchen was a pleasure to cook in, the BBQ and pool area are fantastic. We had one issue with a faulty air conditioning unit and it was fixed within hours, communication with the owner and the key holders is second to none. There are a couple of bars within walking distance which we tried but honestly we were happier spending the evenings splashing in the pool and playing games. Benidorm is a 15 minute drive away, Altea about the same, Terra Mitica (roller coasters etc) 10 minutes away, as is Aqualandia (Water slides) - there's just so much to do within a short drive. There's an amazing sports centre close by where the kids could play football, free golf putting, BMX track etc. All the main supermarkets are a 5 minute drive away, a few good restaurants in La Nucia (Carbon was fantastic; friendly staff, good menu, reasonable prices and wonderful views from the terrace). I wouldn't hesitate in recommending this villa, however a car is essential to really make the most out of a visit to the area.